UPDATE: The Girl Scouts will also offer Trios, a second gluten-free option with peanut butter, oatmeal, and chocolate chips. It's still a few days away, but 2015 is shaping up to be a huge year for the Girl Scouts. First they announced they're going digital with online cookie sales and now, they're preparing to unleash two new flavors on the masses. Those would be Toffee-tastic and Rah-Rah Raisins, which will join the usual crop of classics on next year's cookie slate. The Toffee-tastic will be the Girl Scouts' latest foray into gluten-free baked goods, after testing a shortbread option earlier this year. It's an "indulgently rich, buttery" cookie packed with crunchy golden toffee bits that's going to select markets on a "while supplies last" basis. Meanwhile, the Rah-Rah Raisin is an oatmeal raisin cookie with tons of Greek yogurt-flavored chunks. 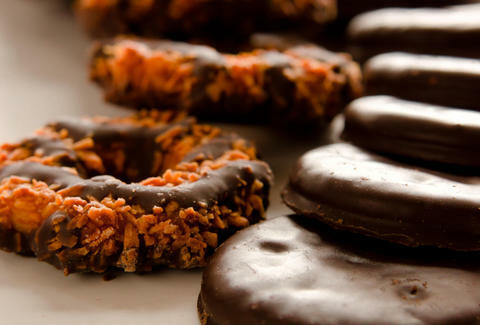 Sadly, it appears the Dulce de Leche and Thank You Berry Much cookies have been killed to make way for these new kids, but rest assured that perennial favorites like Thin Mints, Samoas, Tagalongs, Do-si-dos, Trefoils, and Savannah Smiles should be stocked at your local chapter. Which means the Samoa "blizzard" is still very much in play. Kristin Hunt is a Food/Drink staff writer for Thrillist, and does love oatmeal raisin cookies, but will probably stick to her usual stockpile of Thin Mints and Samoas. Follow her at @kristin_hunt.